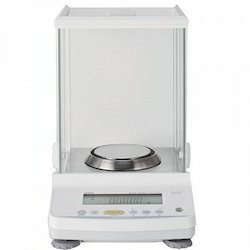 Leading Manufacturer of precision gold balance, analytical balance internal calibration, 6 six digit 0.000001 gm micro analytical balances, precision balance, halogen moisture balance and shimadzu 0.001 g / 0.01g / 0.1g top loading balances - uw/ux from Chennai. Auto Calibration with External Weight. 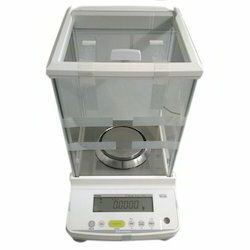 Multiple weighing units: g, mg, oz, ozt, ct, mom, dwt, grain, specific gravity (either tael or tola can be added upon request) Comes equipped with the handy AD-1688 weighing data logger Clearly visible, reverse-backlit LCD GLP/GMP/GCP/ISO compliant output Clock and calendar function Data memory function RS-232C and Quick USB interfaces as standard Counting mode with the Automatic Counting Accuracy Improvement (ACAI) function Percent mode function Comparator function with buzzer Auto power on function Underhook function Special pans/holder (BM-20/22) Density determination function and an optional density determination kit (for BM-252/200/300/500 only) Optional pipette accuracy testing kit Windows Communication Tools software (WinCT) on CD-ROM. In built rechargeable battery for continues use. Fully-automatic calibration PSCThe balance detects variations in the ambient temperature that influence accuracy and automatically performs calibration to compensate it. Data managementGLP/GMP/ISO calibration reportCalibration report can be automatically printed with the optional electronic printer. 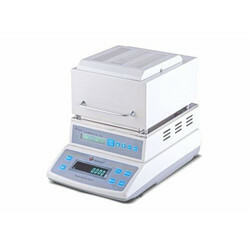 Date, time, serial number and ID are also output to meet GLP/GMP/ISO requirements. WindowsDirect functionThe balance communicates directly to a PC with Windows® applications. No additional software is needed to interface with spreadsheets, databases, word processing, and laboratory software. Windows Direct works with Windows® 95, 98, 2000, NT4.0, ME and XP. PC must be IBM PC/AT compatible. Menu Operation Key Easy to operate key layout Menu navigation keys are separated from weighing operation keys and arranged in a familiar 5-way navigation circle. Up, Down, Right, Left and Enter are the simple operational steps.Easy Setting Best fit to weighing application Quickly adjust the desired ratio of stability and response for every application, even during measurement, with one touch operation. 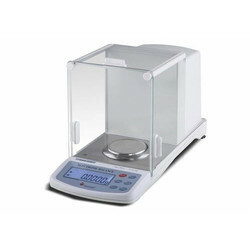 Unit weights of up to 5 different samples can be easily entered, stored and recalled for use.Illuminated display provides comfortable display visibility in all settings. TXC and TX models with 1mg minimum display feature a sliding glass door type windbreak as standard configuration. The highly transparent system includes semi-transparent corners and maximum door opening capability.Fast and flexible calibrationBalance display provides prompts for calibration procedure and accepts your choice of external calibration weight. Menu Operation Key Easy to operate key layout Menu navigation keys are separated from weighing operation keys and arranged in a familiar 5-way navigation circle. Up, Down, Right, Left and Enter are the simple operational step. Send balance data to Excel or other Windows applications without any data communication software installation required. All you have to add is one RS-232C cable. 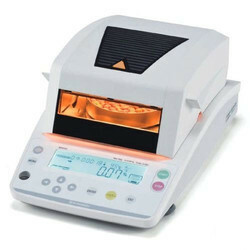 By combining standard Auto Print functions with typical spreadsheet functions, even difficult applications can be easily automated.Expanded Piece Counting function Unit weights of up to 5 different samples can be easily entered, stored and recalled for use.Illuminated display provides comfortable display visibility in all settings. TW/TWC models feature a sliding glass door type windbreak as standard configuration. The highly transparent system includes semi-transparent corners and maximum door opening capability. Fast and flexible calibrationBalance display provides prompts for calibration procedure and accepts your choice of external calibration weight. 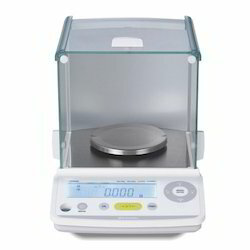 New standard of analytical balance: ATX/ATY series realized superior performance and budget price with Shimadzu weighing sensor UniBloc. 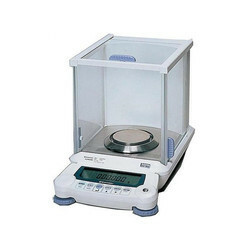 This model achieve usability and high accuracy as analytical balance. Touch-Key calibration (ATX series)Automated calibration can be started by pressing keys. 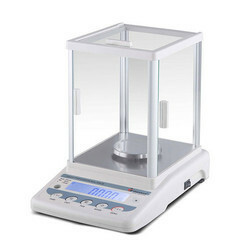 Also, your external calibration weights can be used for span calibration (all models)Easy Setting best fit to weighting application Quickly adjust the desired ration of stability and response for every application, even during measurement, with one-touch operation.Windows Direct communication function Send balance data to Excel or other Windows applications without any data communication software installation required. By combining standard Auto print functions with typical spreadsheet functios, even difficult applications can be easily automated. Very large size panThe pan size of AT series is 91mm dia. It's the biggest one in this class and you can set large container (e.g. flask) easily. 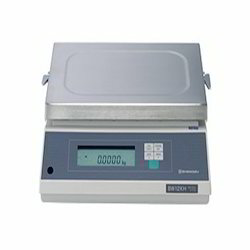 Large PanA large sample pan (130mm diameter) enables a large amount of sample to be placed evenly in a thin layer. This results in accurate and fast measurements with minimal drying non-uniformities.Long-life heaterA mid-wave infrared quartz heater provides effective drying without interference for a wide range of samples. 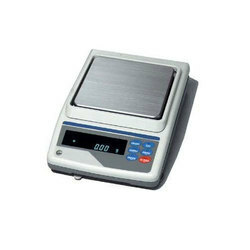 In addition to the excellent drying performance, it offers a long operational life of 20,000 to 30,000 hours.UniBloc sensorThe internal precision weighing balance is engineered with a Shimadzu UniBloc cell. The mechanism provides excellent stability and a long operational life against repeated temperature changes, enabling easy measurements down to 0.001g.Moisture vaporization monitoringThe moisture vaporization rate is monitored and can be visually seen on a bar graph display. This is useful to know as the measurement nears completion. It updates every 30 seconds. Ending modesAutomatic ending modeAutomatically ends measurement when moisture loss over the previous 30 seconds becomes smaller than specified percentage.Timed ending modeAutomatically ends measurement when the specified amount of time has elapsed. The MOC-120H is equipped with a unique auto-taring mechanism, which adjusts the zero drift automatically and ensures high accuracy, even when measuring during an extended period.Bias correction functionThe bias correction function allows adjustment to the data obtained by other measuring methods or other testers.Backlight LCDLarge backlit LCD is easily read even under poor lighting conditions. Choose one of the two models according to your requirementsExcellent response, stability and zero return performance in a semi-micro balance. Choice of fully-automatic calibrations: PSC and Clock -CALOperator can choose from two types of fully-automatic span calibration methods. "PSC" is initiated based on temperature change detection, and "Clock-CAL" operates at user pre-set times (up to three times a day).Fully-automatic calibration Clock-CALThe balance automatically performs calibration at selected times, up to three times a day (e.g. before starting work, during lunch-break or after work). GLP/GMP/ISO calibration report Calibration report can be automatically printed with the optional electronic printer. 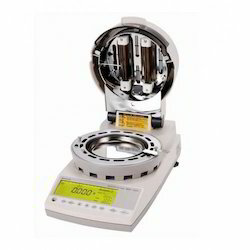 Date, time, serial number and ID are also output to meet GLP/GMP/ISO requirements. Windows Direct function The balance communicates directly to a PC with Windows® applications. No additional software is needed to interface with spreadsheets, databases, word processing, and laboratory software. WindowsDirect works with Windows® 95, 98, 2000, NT4.0, ME and XP. PC must be IBM PC/AT compatible. Halogen heater: Long-life and high power halogen heater provides quick and accurate measurement. Please download from here. Windows Direct Send balance data to Excel or other Windows applications without installing additional data communication software. By combining standard Auto print functions with typical spreadsheet functions, even difficult applications can be easily automated. Automatic ending mode: Automatically ends measurement when moisture loss over the previous 30 seconds becomes smaller than specified percentage. Timed ending mode" Automatically ends measurement when the specified amount of time has elapsed. Alternative drying modes: Rapid drying mode First dries with the highest temperature for the specified period, then shifts to the specified temperature, shortening measurement time. Slow drying mode: Gently heats samples that might solidify at the surface or samples that reduce under high temperature. Step drying mode: Allows step-by-step change in drying conditions. This feature is useful when measuring samples that contain a large amount of water. Starting mode: Automatic starting modeStarts measurement immediately after closing the lid. It saves time in repeat measurements. 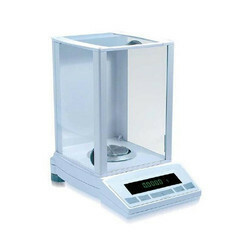 Electronic Balances for Weighing Animals Dedicated software brings quick and reliable results of live animal weighing.Upon removing the weighed animal, the weight of remaining feces and output are automatically tared off, and the balance presents zero for the next animal. Order a standard balance plus one of the applicable animal bucket sets. Power Supply 4 X AA cells and a power adapter. 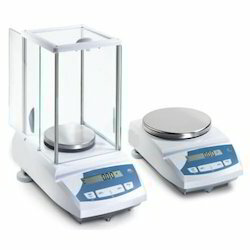 SMKSpecific Gravity Measurement kitSimple specific gravity meters based on precision balances. Combination of Shimadzu balance and SMK Specific Gravity Measurement kit makes handy specific gravity measuring equipment for solid samples. AUW-D/AUW/AUX/AUY, AW/AX/AY, UW/UX, and EL/ELB Series. 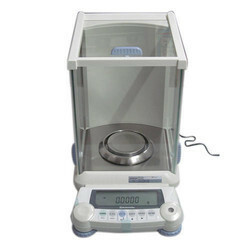 Order one of the balances and the corresponding SMK Specific Gravity Measurement kit. Liquid specific gravity can be also measured with a sinker (except for EL/ELB Series). SMK-401 321-60550-01 AUW-D/AUW/AUX/AUY ??? ??? SMK-301 321-60550 AW/AX/AY ??? ??? SMK-101 321-60576-01 UW/UX (Capacity 2200g or more) ??? ??? SMK-102 321-60576-02 UW/UX (Capacity 420g-820g) ??? ??? SMK-201 321-42253 EL/ELB (Capacity 600g-6000g) ??? A sinker is additionally needed for liquid specific gravity measurement. Automatic span calibration Choice of fully-automatic calibrations: PSC and Clock -CAL Operator can choose from two types of fully-automatic span calibration methods. "PSC" is initiated based on temperature change detection, and "Clock-CAL" operates at user pre-set times (up to three times a day).Fully-automatic calibration Clock-CAL (AUW only)The balance automatically performs calibration at selected times, up to three times a day (e.g. before starting work, during lunch-break or after work). Fully-automatic calibration PSC (AUW and AUX only)The balance detects variations in the ambient temperature that influence accuracy and automatically performs calibration to compensate it. GLP/GMP/ISO calibration report (AUW and AUX only)Calibration report can be automatically printed with the optional electronic printer. 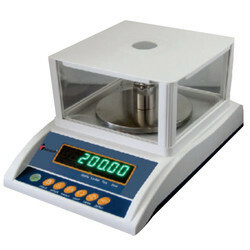 Date, time, serial number and ID are also output to meet GLP/GMP/ISO requirements. Windows Direct function The balance communicates directly to a PC with Windows® applications. No additional software is needed to interface with spreadsheets, databases, word processing, and laboratory software. Windows Direct works with Windows® 95, 98, 2000, NT4.0, ME and XP. PC must be IBM PC/AT compatible. Interval timer (AUW and AUX only)Weighed data can be output to external devices at user pre-set intervals. Backlit LCD (AUW only)LCD with backlight can be read with ease and comfort under any lighting condition. Stress Free - Reliable weighing results: Built-in High-Performance Ionizer (Optional)A new ionizer is able to remove static electricity in about 1/10 the time of previous ionizersThis unit allows acquisition of reliable weighing results by eliminating static electricity that can affect measurements without scattering powder. USB Offers Greater Expandability (USB host : APW only) NEWEquipped standard with an RS232C connector, a USB device and a USB host. You can now simultaneously send output to both a computer and printer or connect a USB flash drive, a barcode reader, or an external numeric keypad. Easy-to-Read Organic EL Display NEWBecause the pixel elements in the organic electroluminescence display emit light, the screen can be seen clearly even in dark locations. Multi-language display capability* provides a more intuitive operating interface. A wider viewing angle has also improved the visibility of measurement values, which helps increase the efficiency of measuring operations. Exceptional VisibilityThe visibility remains the same even when viewed from different angles. The viewing angle is a wide expanse of ±85 degrees, both vertically and horizontally. That means the display is clearly visible even when working beside the balance. A high-resolution dot-matrix display makes it easy to read even detailed text. * Japanese, English and ChineseDisplay capture functionWeighing display can be recorded into USB memory in BMP format. User name, date/time, setting can be done with display information. Numeric keypadConnecting a common external numeric keypad makes it easier to enter numeric values. This is especially useful for entering the mass value of weights, setting upper/lower limit values for the comparator function, or entering the sample count during piece counting mode. Barcode readerA barcode reader can be connected. Simply reading a barcode makes it possible to input user ID/Password. It is possible to manage sample IDs using barcodes. Periodic Inspection Support Function (APW/APX only) NEWAP series supports periodic inspections. The function allows inspection of repeatability, corner load error, and linearity by simply following instructions displayed on the screen. Instructions are shown on the display: The target weighing value is shown on the display and analog bar in order to compare the target with the current weight. Manual calculation is not needed. Record function: Record output with date, time and operator name. PSC and Clock-CAL (APW/APX only)A Perfect Self Calibration (PSC) function is included. 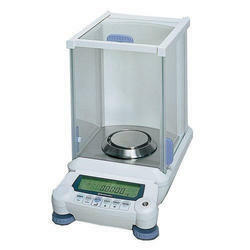 The analytical balance automatically detects any temperature changes that could affect sensitivity and automatically starts calibration. The clock-CAL function enables automatic calibration at a pre-specified time (for example, before starting work, during lunch, or after work hours). Quick response Very fast response for operator comfort and efficiency. 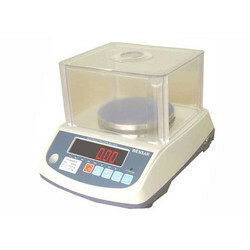 High stability Even if the environmental conditions are not ideal for precision weighing, the high stability mode of BL Series produces steady readings. Piece Counting function Piece counting function is standard. Analog Bar Graph Display Remaining weighing capacity can be seen at a glance. Easy unit conversion Switching between various units is by simple key-touch. Equipped with a square pan Offers ease of operation. Compact body: This electro-magnetic precision balance is as compact as a portable scale. Calibration carried out at user-preset times (up to three times a day) Operators can work without unexpected interruptions.GLP/GMP/ISO calibration report Meets requirements of GLP/GMP/ISO9000. Calibration reports can be output with data and time, provided by the built-in clock.Windows Direct Communication function Send balance data to Excel or other Windows applications without any data communication software installation required. By combining standard Auto print functions with typical spreadsheet functions, even difficult applications can be easily automated. RS232C interface is needed.Application support Unit conversion Automatic unit conversion at the push of a button. Carat and other units are standard.